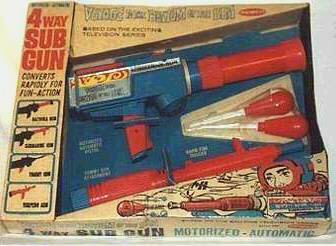 Immediate right, it's the Remco 4 WAY SUB GUN which sells for big dollars when it actually comes up on ebay. Taken from Remco's shelf of generic toys, this gun was designed to snap together to make four different weapons, a bazooka, a submarine gun, a Tommy gun, and a torpedo gun. "Converts Rapidly for Fun-Action" claims the box. The gun itself was a spacey looking thing with a logo sticker on the handle. It was packaged with an extension and two rubber tipped torpedoes, so says the Voyage Collectibles website. 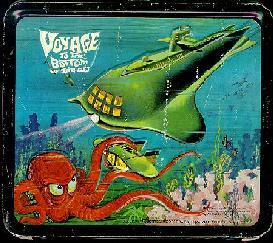 Oddly, I never bought this particular item as a kid, because I knew it really didn't have anything to do with Voyage. Boy, what a chump! This is the only item seen in my collectibles section that I don't have. onslaught of giant clams and lobstermen. Bottom side graphics seen below. The Voyage to the Bottom of the Sea, lunchbox was visually stunning with art by Elmer Lehnhardt, the man credited for coming up with the idea to emboss Aladdin;s steel kits in 1962. Excellent use of color makes this one of the great "art pieces" in lunchbox history. Other lunchbox art created by Lehnhardt for Aladdin include The Beverly Hillbillies, Bonanza, The Beatles, Batman, Gomer Pyle, Hogan's Heroes, It's About Time, Laugh-In, Rat Patrol, Dr. Doolittle, The Flying Nun, and Gentle Ben and Land of the Giants. Thanks to his and his successor’s foresight, most of Lehnhardt's original art is under lock and key in Aladdin's archives. 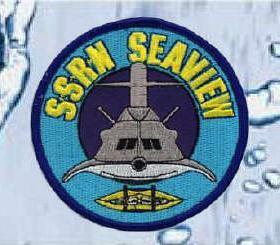 Left, an early version of the Seaview patch without the Flying Sub. 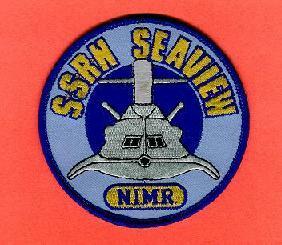 The more prevalent version now includes the Flying Sub under Seaview in place of the NIMR logo as seen at right..
All of the patches are nicely produced, and occasionally offered on bay. They usually go for reasonable prices. Below, the NIMR logo.